Construction crews have gutted the insides of the space in the State Line Shopping Center, just south of 75th St. and State Line Rd., that will house a Noodles & Co. restaurant slated to open late this summer. 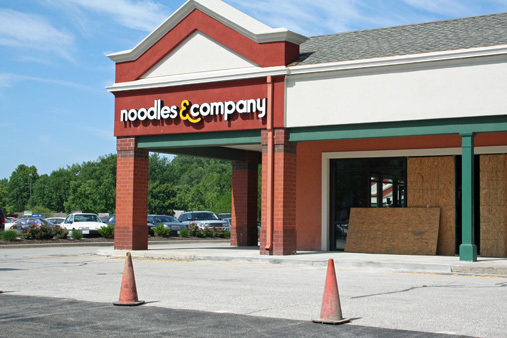 A Noodles & Co. location opened up on the Plaza in March in the space on the corner of Jefferson St. and Nichols Rd. that had long been occupied by McDonalds. The company, a national chain based in Colorado, has six other locations open in the Kansas City metro area, and one in Lawrence. The menu features Asian, Mediterranean and American noodle dishes. Next articleSevere thunderstorm warning in effect until 1 p.m.